9th Dimensional Pleiadian Collective Part 2. In part 2. of 9th Dimensional Pleiadian Collective I wanted to talk more about how this information helped me to shift my consciousness further into the expansion of what “I Am”. After a couple days without power , it was clear that the energy from the sun was not only effecting mother earth with freakish weather and increased seismic activity, it was also having its effect on the human population. One of the first realizations that came to me back in 2009 when the sun began to wake up again , was its influence on human consciousness, my own to be specific , but I could also see it in others , as well as the collective. It became a bit of a hobby to monitor solar activity and its effects on the human population , and after a while I could start to see the correlation between increases in solar activity and how that manifested in the human population as revolutions , economic upheaval , wars, shootings and a general increase in all manner of heightened human emotion, negative and positive, there was just “More Source Energy” to work with. Then I come across the 9th Dimensional Pleiadian Collective last week during the solar events and I started listening to Wendy and Nora I have to admit that the “Mind” found it all a bit laughable , however the more I listened with my heart, to just the information the more resonance I found , always follow the heart. This collective of 2500 Pleiadians or fractals of all that is , is really just one being they say, just like the entire universe is one being, broken down into collectives, groupings , of like minded , kindred travelers of the multi verse, working our way from darkness to light , light to darkness, purely for entertainment, yes it’s a game “all that is ” plays purely for the experience, for the joy of “It”. And this is where many people stumble , they want to take everything so seriously. However as you awaken you lean towards not taking things so seriously , you want to lighten things up a bit , you want to bring in more light, have some fun , and this is all a natural , “Normal” process. One of the great by products of expanding your awareness is that you can have “individuated consciousness” and collective awareness , at the same time , the two are not mutually exclusive, and is the natural state of being in the 5th dimensional consciousness construct. Here in 3d 5 sense reality , we are confined to the “individuated consciousness” perspective, and this is an incredible opportunity and quite a lot of fun for multi dimensional beings like ourselves , again its a type pf simulation , a construct, that we are willing participants in , just for the adventure, the growth and the continued expansion of all that is. We transmit all of our individual and collective experiences throughout the entire universe, it’s instantaneous , as we are fractals and holographic in nature , this is how all that is experiences itself , and how we can all learn from each other. All of the information coming through from this 9th dimensional Collective is very resonate for me and the vibrational frequency I am personally tuned in to, and there will be others out there who will also benefit from joining in on this conversation. Some of the key areas where I found incredible resonance while listening to this group, this being we call the Pleiadian Collective are as follows. 1. The concept of the suns solar flares as data packets or upgrades to human consciousness. 2. The idea that we don’t change the outer world , we can only change ourselves , our own personal template , and by doing so we become a living template that others can emulate if they choose to , which in turn does impact the outer world, remember all that is, the universe , is holographic in nature. 3. The game is actually Decension and Re ascension , since we are already source, we are already “all that is “, we are not starting from the bottom and working our way up . It may appear that way from the limited 3d perspective because that is the game , that is the illusion , that is why we decided to play. We chose to plunge into the depths of the slowest vibratory rates in creation known as as physicality or 3D , for the illusion of cutting ourselves off from source. 4. From the perspective of 5D reality we not only can do “Anything” we can do “Everything” , there are no limitations. 5. We are not really separate , not really different , we have just created constructs or filters what we call personalities , that we have clothed source energy into for the purpose of experiencing what it it is like, to have a unique perspective. 6. We do not change the world , we change our own vibrational “state of being”, and by doing so we can then experience realities , or versions of Earth that are a match , vibrationally, this is part of the game, the reward so to speak , how to get to the next level of adventures. 7. The game does not end so to speak after leaving the 3rd dimension , the game if you will continues up an outward through all dimensions , albeit with less contrast. So for example , polarity does exists for those in the 9th dimensional collective, its just not to the extremes that are here in 3D , and those in 9D are completely aware of it and the game. 8. There is only the “Now” moment , past and future are just constructs of the 3d matrix, again its a way to disconnect from the other time-lines ,lifetimes or versions of Earth that are all running concurrently , simultaneous. It allows those of us in the game to have the perception of linear time. 9. Love as a “State Of Being” , not the emotional roller coaster ride we associate with emotions of romantic love or love normally associated with human relationships which are for the most part all based on conditions. 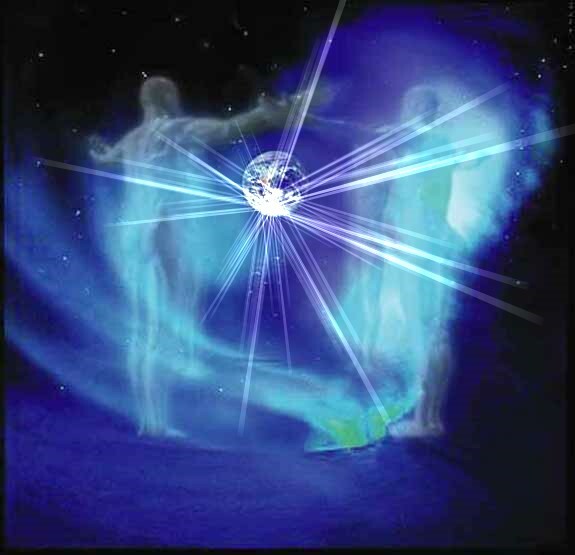 Love as a “State Of Being” is a place where all is supported, in a sense this “type of love” if you will is another name for “all that is ” source energy, infinite consciousness and so on, it is pure creation energy, beyond duality , polarity , it is the unified field. These nine represent the most resonate aspects of the information coming form this collective, and all of these concepts you will find are highly empowering, which is your first clues as to the validity perhaps, or at least the usefulness, as tools for expanding your awareness into more of what you are. So , with all that said , please enjoy the video below of Wendy and Nora as they tag team for the 9th Dimensional Pleiadian Collective , yes Nora may seem a bit goofy at times, obviously not taking it so seriously , but that just makes it all the more fun and as Nora says , we all can and should be , having plenty of fun with this , no matter what the circumstances ! 9th Dimensional Pleiadian Collective Part 1. As an aware observer and participant we received a significant update over the last week from about March 11th 2012 to March 16th, it was unprecedented and incredible to experience first hand as a fractal of “All that Is ” . The updates we triggered by sunspot AR1429 , one of the most influential sun spots so far in the current solar cycle 24, as scientist like to call it, its really just the sun doing what it does, bringing source energy into all the dimensions of our solar system. My personal experience From March 11th – March 16th , was quite challenging, we were hit with freakish weather that left thousands, including myself without power for days, life became more challenging. However because I have become adept at listening to higher self I was prepared with a generator and provisions that made things more bearable, again , a tangible benefit from being awake , aware and having an open channel between the heart and the mind, allowing the heart to direct the mind to take action , remember the heart is for multi dimensional thinking. You are “Always” better off , allowing the heart to guide you. As the energies from the sun made there way into physicality , I could see the reactions in those around me from this increase in vibrational energies, these updates to the individual and collective consciousness at work and at home, and I did my best to help modulate , and mitigate some of the anxiety that many felt. It was absolutely fascinating to watch the subtle influences these energies had on people , but one thing stood clear , the more aware the individual is about what is “Happening” , the less negative impact it had on them , and in fact when you are completely awake and aware about the nature of the sun’s , updates, data packets as I like to call them, then you will actually feel incredibly empowered by all this solar activity and will in fact look forward to the arrival of this energy. One of the benefits of the latest upgrade and the ensuing loss of power and disruption of “Normal ” Life was the opportunity to test my ability to remain calm and centered , “No Matter What The Circumstances” were around me and to monitor my “State Of Being” which is the “Only” thing that “Matters” ! And because I had a generator and plenty of fuel , and food, I was warm and dry and I had access to continue my daily research into the nature of reality , at all levels of my existence , and one of the things that came to me , that ended up on my radar if you will is the concept of the 9th Dimensional Pleiadian Collective. In part 2 of this Article , I will share with both my inner and outer revelations about this incredible store house of information , that we can all tap into and use to assist us in Navigating The Apocalypse.